Let me start by explaining what a thoran is. Ideally I should have done this when I posted the colourful carrot, beetroot and tendli thoran when I just started the blog. Nevertheless, it is never too late… thoran is basically the Kerala version of a stir-fry. We Keralites love our thorans and they accompany almost all regular and festive meals. You will see them at traditional weddings, sadhyas, onam meals or on any given day at any regular meal. You will find them on the menu of any typical Kerala restaurant and if you happen to walk into a one and order a quick “thaali” or meal of the day, you will find atleast one thoran amidst the wide array of dishes on your plate. A true Keralite can probably cook up thoran with any vegetable you give them!! While thoran made of cabbage, green beans, carrots, beetroot, spinach, tendli, cauliflower are the more common ones, I have also heard of and tasted thorans made of jackfruit, kale leaves, yam, papaya, mushrooms and even only onions. Have you ever cooked up a thoran with a not-so-common ingredient?? Whatever vegetable is being used, is finely chopped (which is the most tedious and time-consuming process while making any thoran), and cooked for a little while alongwith coconut, curry leaves, mustard seeds, green chilies and turmeric powder. That is the basic concept. Variations are totally subjective. 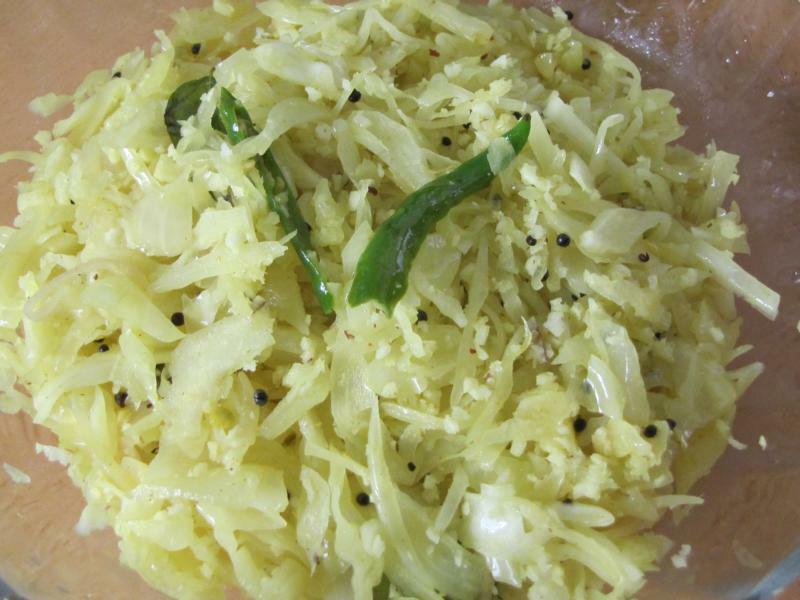 So here is one of the most common thoran recipes – cabbage thoran. It is literally ubiquitous in the malayalee world. It is made quite often at my place, sometimes part of a simple meal accompanying dal and rice or sometimes part of an elaborate sadhya – festive meal. 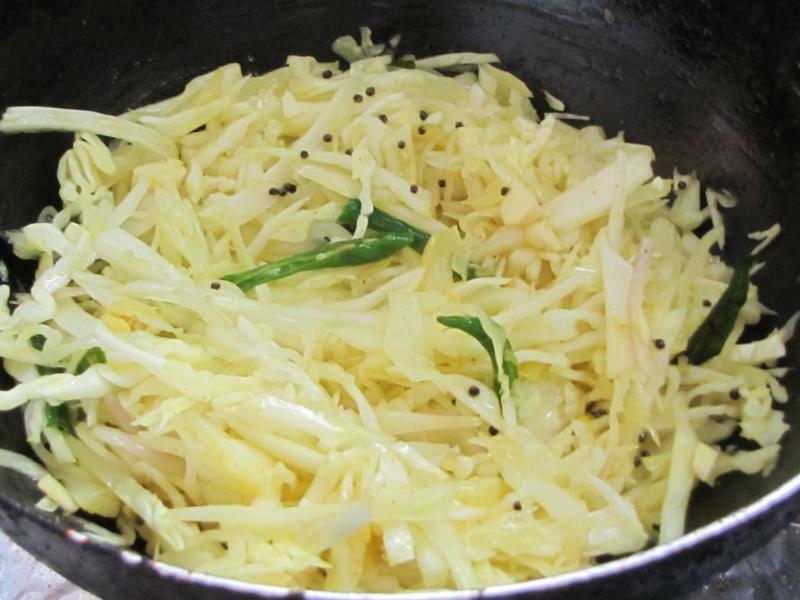 Now there are several ways of making a good cabbage thoran. This is just the way I make it… it is basic, simple and very easy. 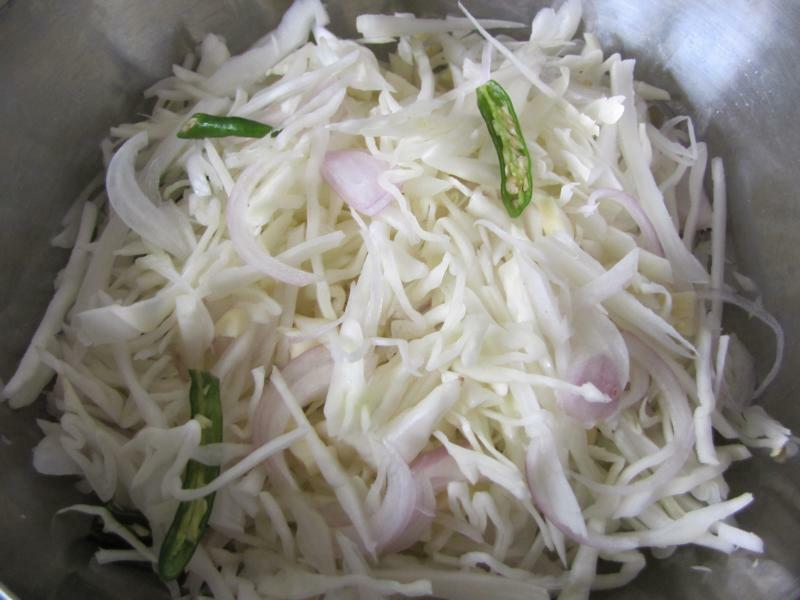 Finely chopped vegetable is the prime requirement of any thoran. You can either do it manually or just put chunks of cabbage in the food processor and give it a whizz. Mix finely sliced onions or shallots, garlic and green chilies with it. Thorans taste best when made in coconut oil. So heat little coconut oil in a wok or deep pan. Add mustard seeds, curry leaves, turmeric powder and salt. Then follow with the cabbage mixture. Cook covered for a few minutes, stirring occasionally. Add grated coconut, mix and cook for few more minutes. Heat oil in a pan and add mustard seeds. Once this starts to splutter add the curry leaves, turmeric powder and salt. After this add the cabbage, green chilies, onion and garlic and mix well. Cover with a lid and cook on medium flame. Stir occasionally. After 5-7 minutes add the grated coconut and mix. Cover with lid again. Cook for another 3-4 minutes. The Thoran does look delicious. Thanks for explaining what it is. I have ever made something like this with cabbage but never knew others make it too. Have a good Sunday!